Knowing the benefits of topdressing will probably convince you that it’s something you should do for your lawn every year, to keep it looking healthy and vital. Topdressing can be very beneficial for homeowners, as well as managers of athletic fields and caretakers for public parks and recreational areas. When you really want your lawn to have that deep green, lush appearance, topdressing is a very appropriate alternative to chemical treatments, and if you’d prefer to avoid chemicals altogether, using a topdressing spreader is definitely the way to go. How Does a Topdressing Spreader Work? Topdressing is the practice of spreading a mixture of soil and compost on the surface of a lawn, either a residential lawn or a commercial area, so as to improve the conditions of the soil itself, and to make your lawn healthier and better-looking. In the old days, the only way to accomplish this was by taking shovel in hand, and using a kind of throwing motion to distribute the compost material over the entire lawn, and if you had to do it for a football-field sized area, you would probably need a few helpers. Nowadays though, there are lots of good top dressing machines available, particularly those from Turftime Equipment, which can literally be used for any commercial lawn or field, as well as on residences. What Does Topdressing Soil Do? Enhanced germination of seeds– When you use topdressing as part of an overall procedure for improving the thickness and lush appearance of your lawn, particularly after aeration and over-seeding, it can make a huge difference in improving your seed germination. As the compost covers the tiny seedlings, they are protected better and have significantly better seed-to-soil contact, which is essential for effective germination. The TT-2075 Advantage Topdresser from Turftime Equipment has a .75 cubic yard hopper that can contain enough compost to cover a wide area of your commercial turf or recreation area. Deeper lawn color– By adding vital nitrogen to the soil where your turf is growing, you will probably notice an immediate deepening of the green color of your turf, which is a sign of good health. Not only is this a solid indication that your turf is thriving, but it has a much better visual appeal to observers. The 2410 Topdresser from Turftime Equipment is a terrific mid-sized topdressing machine that is still compact enough to handle smaller operations, but also has the size to tackle some larger applications as well. This is a great little machine with versatility that allows it to be used for a wide variety of situations. Increased microbial action– It’s always necessary to have colonies of beneficial microorganisms living in your soil, because they assist with nutritional intake, and that makes nutrients from the soil available to the grass itself. Sometimes, microorganisms also assist with the process of breaking down thatch, which also helps to improve the health and vitality of your turf. Some varieties of microorganisms also are known to aid in the suppression of pathogenic organisms which can eventually lead to diseases which might be contracted by your turf. Overall improvement of soil conditions– Ideally, your soil should be composed of somewhere between six and 12 inches of high-quality topsoil, without excessive amounts of sand or clay. This will allow grass shoots to delve down around a foot deep to anchor their roots and establish a solid base for growth. There must also be a good supply of moisture, without having excessively moist conditions that would drown out grass shoots. To achieve this kind of ideal soil condition, you can start topdressing soil so as to achieve just the right mix. 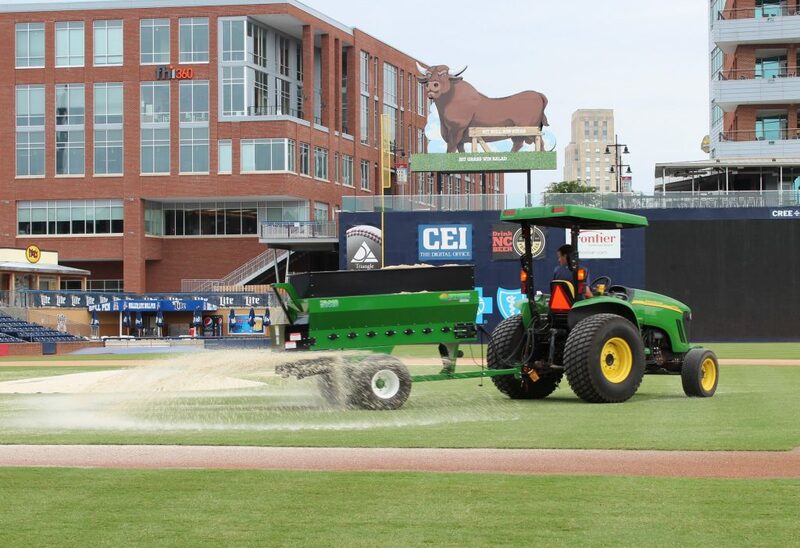 When you have a big job of topdressing ahead, like the entire grounds of a high school or university, you might want to consider the TT-3050 Advantage Topdresser from Turftime Equipment, so as to save time and money in applying your compost material. You can include a whopping 8 cubic yards of compost material in the hopper of your TT-3050 Topdresser. Which Topdressing Spreader is best for you? The answer to this question will depend on how big an area you have to spread your compost over, and how frequently you intend to do the job. You certainly won’t want to stand in front of a mountain of compost with your trusty shovel, anticipating a whole day of compost-spreading. Remember, you can make your lawn or recreational turf much greener and healthier, and you can improve microbial activity as well as seed germination by topdressing your soil with one of the terrific topdressing machines from Turftime Equipment. Give us a call at 800-201-1031 or fill out a contact form to get started!